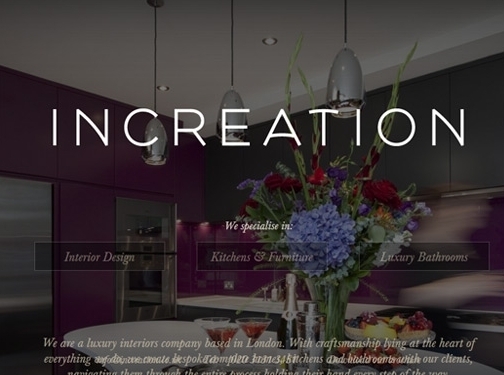 Increation are an interiors company that was born ten years ago out of an understanding that people needed a complete service they could rely on and they needed limitless possibilities. At increation the full service fromdesign, to cabinet making, to installation is managed - we have a saying that we even set your clocks and it's true. Walls, floors, lights, fittings, soft furnishings, everything you imagine a room or complete home to be, we create all under one roof. Elegant craftsmanship lies at the heart of everything we do. Each and every project is started fresh, we carry only our experience and knowledge into each new project everything else we create bespoke from scratch for you. UK (London) based company - established over 10 years ago - providing interior design services. Website includes details of services provided, case studies, testimonials, press mentions, regularly update blog, associations, full company contact details including company registration and VAT numbers. Website also includes mobile/smartphone friendly design.